Hello and welcome to the October Stampin Friends Blog Hop! If you've been hopping already you should have landed here from Elizabeth's awesome blog! If you missed it, make sure you click Previous to go back to check it out!! I started with an A2 Basic Black card base. My second layer was Pumpkin Pie Cardstock that was stamped tone-on-tone with the Watercolor Wash background stamp. I used my Circles Collection Framelits to cut out the "moon". Whisper 'White cardstock was sponged with Daffodil Delight Ink and some highlights of Pumpkin Pie ink to make my moon. I then taped it behind the cut out and adhered the layer to the Basic Black cardbase. I added a tree limb by punching out a black tree with the Tree Builder Punch. I trimmed off the upper branch and then glued it to the left side of my card. I added a Black Spiderweb Doily and my sentiment from an older set "Mingle all the Way" that was stamped on Whisper White and backed with a layer of Basic Black Cardstock. My owl was cut out using The "Boo to You" framelits on Basic Black cardstock. The owl's eyes were punched out with the Owl Builder Punch. I handcut a little beak with Daffodil Delight cardstock. The owl's head was cut out with the Circles Collection Framelits. I used a smaller Circle Punch to punch into the top of his head. The white part of the eyes was Whisper White cardstock punched with the 1" circle punch. The black of the eyes was punched form the Owl Builder Punch. The front of the fry box was covered with Black and White Happy Haunting Washi Tape. The wings were Circle Scallops that were cut and glued to the side of the fry box and then folded into the Owl's body. I realize it's a little hard to see with the "Boo" tag but after having him all made I really thought he needed a tag. 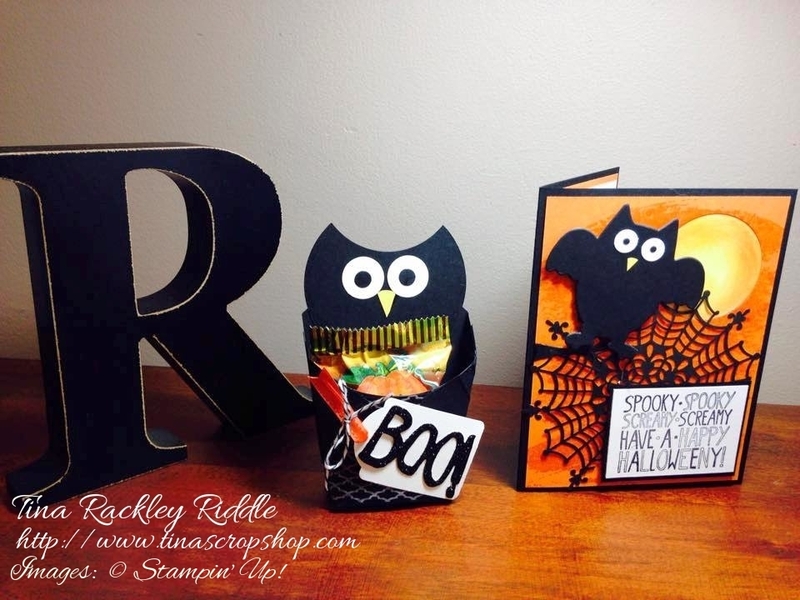 I punched out a Note Tag and then cut out the "Boo" in Black Glimmer Paper from the "Boo To You" Framelits. I added some Orange Ribbon and tied it with Basic Black twine. I think he turned out really cute, maybe not scary but definitely cute! 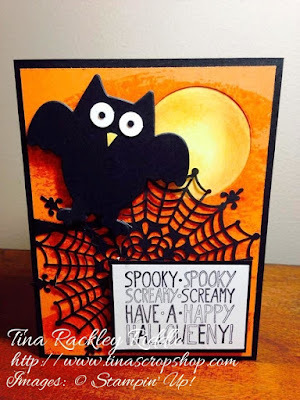 I hope you've enjoyed my Halloween card and treat holder and are ready to click the next button to continue on to my good friend, Lisa Altman's blog! Oh...but before you hit next, make a note of my favorite stamp set.. it's "Traveler" and then make sure you leave me a comment. Once you've hopped all the way through and commented on everyone's blog, email Elizabeth at happystamper508@gmail.com and tell her you've commented and give her the name of all of our favorite stamp sets and she'll enter you in for a drawing of a $25 gift certificate for Stampin' Up! Easy Peasy.. hope you win! Just in case you got lost along the way, here's a list of all of the bloggers on this hop! 9. Tina Riddle - You are Here!! Love your OWL! So creative. Love these projects! And who doesn't love an owl? Way too cute, Tina... way too cute! TFS and have a blessed day! Thanks my friend! Blessings to you! I really like the owl box. Thanks for sharing. The treat holder is so awesome! thanks for sharing. Love the background on the card! Great ideas. I love owls too. The card is super cute, and the treat box is so original. Tina! You always do such an over the top amazing job! Wonderful! Oh the cuteness! 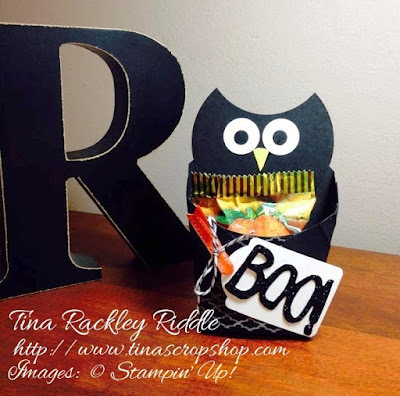 I love your owl projects! Way to get creative building your fry box owl-I love that! That is the cutest card and owl fry box treat holder! I love the Boo to You Framelits and have used them a lot ~ a bundle that has paid for itself for sure. I haven't used it without the stamp yet - didn't think about it so I do like the idea - it looks good. 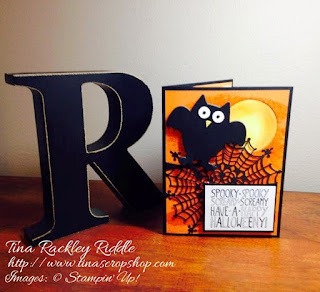 The Spider Web always dresses up a project so I like it on the card. Love how you used Owl Punch Art on the Fry Box so it would match your Owl Card. Clever. They look good. Thanks for sharing the ideas. Awesome as always! You do things I wish I'd thought of! Love it all. Aww. thanks so much Andrea! You rock, as usual, Tina!! Love the owl!! Tina I just love owls! Love the card also love the owl fry treat holder!